Pinnacle® Vodka is a paid sponsor of this post. Happy November, friends! I’m so excited that the holiday entertaining season is upon us (my favorite time of year) and that many of you are requesting seasonal cocktails that are perfect for parties. I personally love warm cocktails for these colder months, but I don’t want to have to stand over the stove stirring up drinks when I’d rather be mingling with my guests. 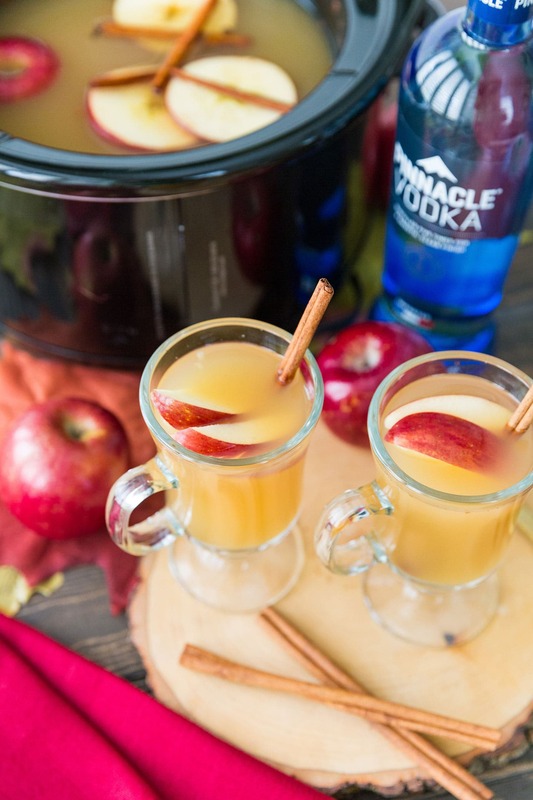 Hence why you will fall in love with this Slow Cooker Caramel Apple Cider Cocktail! 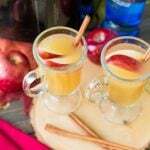 A delicious holiday cocktail you can make in the slow cooker! Combine ingredients in slow cooker and cook on low for three hours. Garnish with sliced apples and a drizzle of caramel. Add lots of apple slices floating in your slow cooker for visual presentation and extra flavor. Aptly dubbed a “crocktail,” this drink is perfect for your Friendsgiving festivities, traditional Thanksgiving gatherings and all your fall parties. I really love the idea of throwing everything together and letting the slow cooker do all the work. We should be able to enjoy our parties, right? Absolutely! Thank you, crocktails! Here are a few crocktail tips to inspire you this November! Double Duty Cocktails – The best part about slow cooker cocktails is that they work double time. They ensure cocktails are ready to go but also make any home smell amazing for the season. Depending on the cocktail, add spices such as cinnamon, peppercorns and star anise, to play with flavors and scents. Once guests arrive, they can also add ingredients as they please! Be Mindful of Ingredients – While it’s tempting to add all slow cooker ingredients in at the same time, there is such a thing as letting items cook for too long. Consider adding certain ingredients, such as award-winning Pinnacle® Original Vodka*, toward the end of the cooking process to ensure the spirit doesn’t get cooked out. Bitter flavors can also start to come out of certain ingredients – especially for lemons and oranges – so be sure to remove those ingredients from the batch once they become fragrant. Better In Bundles – If your crocktail recipe calls for using citrus peels or whole spices, like cloves or cinnamon sticks, bundle them up in cheesecloth so guests don’t get any unwanted fragments in their drink. Tea balls are also a great substitute for cheesecloths. Cold or Hot – Crocktail recipes are versatile and are also great when served cold, so consider serving it both ways. For cold concoctions, prep in a pitcher with ice for a chilled version so each guest can determine their preference for hot or cold. 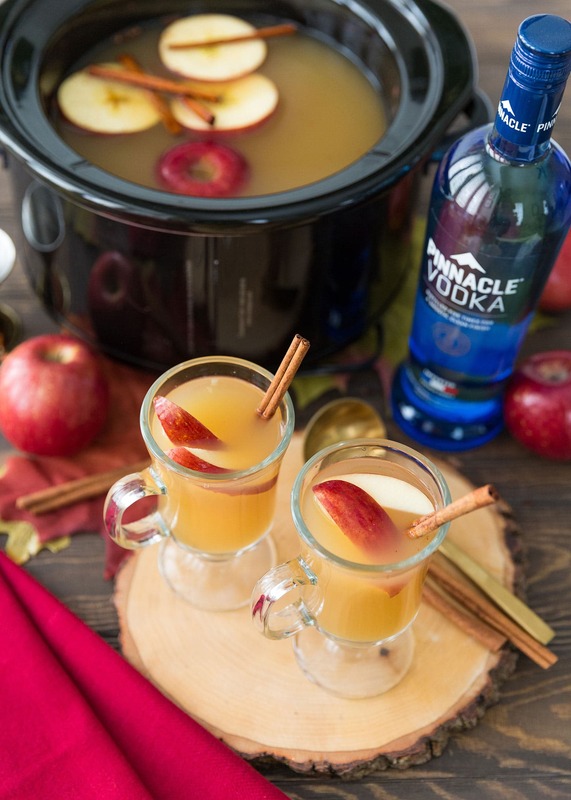 If you try out this Slow Cooker Apple Cider Cocktail, let me know! I’d love to see how you and your guests enjoyed it! And if you’re looking for another fall-themed cocktail, check out my Pumpkin White Russians here. Thanks to Pinnacle® Original Vodka for partnering with me on this cocktail series. Pinnacle® is a registered trademark of Jim Beam Brands Co. (“Beam”) and is used with permission. The information, comments, and ideas expressed on this website do not necessarily reflect the views or opinions of Beam, it’s affiliated companies, or any of their directors or employees. Beam does not sponsor, authorize, or otherwise endorse this website.